Australia's 116-year-old constitution bans dual citizens from holding national office, in a bid to prevent split allegiances. 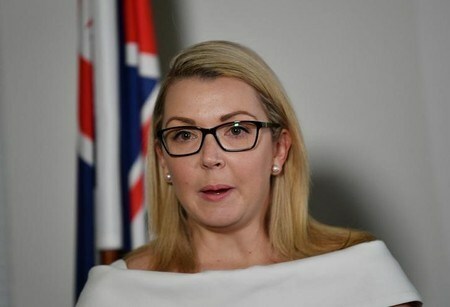 A ninth Australian lawmaker quit parliament on Wednesday after discovering she was a dual national, the latest casualty in a widening constitutional crisis that has already cost the government its majority. The resignation of Skye Kakoschke-Moore, one of three senators in the center-right Nick Xenophon Team, over the surprise revelation that she was a British citizen by descent, does not affect the government's position in the upper house. "Their advice was extremely surprising to me," Kakoschke-Moore told reporters in Adelaide, after having learnt from Britain's Home Office that her mother's birth in then-colonial Singapore in 1957 made her British by descent. The crisis, which is likely to ripple even wider in coming weeks as lawmakers are required to prove their status, has already cut a swath through Australia's parliament. The ruling center-right coalition lost its one-seat majority in the lower house after Deputy Prime Minister Barnaby Joyce was found ineligible for office and expelled by the High Court. Another resignation has since weakened it further. Adherence to the dual-citizenship rule, in a country where more than half the population of 24 million were either themselves, or have a parent, born overseas, has only recently come under the spotlight, with the High Court adopting a strict interpretation of the law. In response, Prime Minister Malcolm Turnbull ordered all lawmakers to prove they comply with the laws by Dec. 5, and at least one lawmaker besides those who have quit has raised the possibility that she is ineligible. Senate votes from 2016 will be recounted to decide on a replacement for Kakoschke-Moore. By-elections set for Dec. 2 and Dec. 16, to replace Joyce and a lower-house government lawmaker who resigned on discovering he was British, are shaping as crucial for the government's survival. Joyce is expected to retain his seat, internal party polling published by the Australian newspaper showed, but former tennis champion John Alexander must contend with a high-profile rival in former New South Wales state Premier Kristina Keneally. The government would be reduced to minority rule if Alexander lost, forcing it to depend on a handful of independent lawmakers to retain power and pass laws.